Einige von Euch werden es ja vielleicht gehÃƒÆ’Ã‚Â¶rt haben, Martha Stewart, die ja ein NÃƒÆ’Ã‚Â¤schen fÃƒÆ’Ã‚Â¼r geldeinbringende Projekte hat :-), hat in Zusammenarbeit mit EK-Success eine Scrapbook-Produkt-Palette herausgebracht, die auch ÃƒÆ’Ã‚Â¼ber Michael’s, einer groÃƒÆ’Ã…Â¸en Bastel- und Hobbykette bezogen werden kann. 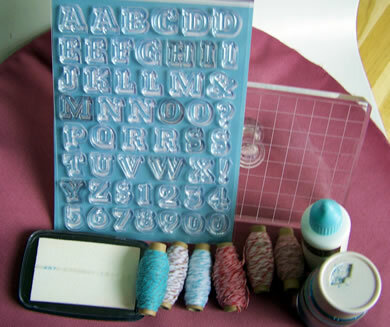 Well I’m sure that you heard that Martha Stewart – who always knows which products are rainmaking – has a new Scrapbooking product line with EK-Success which is available at Michael’s. There had been a lot of negative and positive posts about Martha Stewart’s products and this made me curious. So when I was in the States I took a look (some of those things just jumped in my basket) and this is what I think: Nice! :-) Let me state it this way – the things are produced in the typical “Martha-Elegance” – for the perfect housekeeper. Paper and Stickers are not exceptional …but…I really liked her basics although she didn’t reinvent those. They won me over though with their design and how practical they are and….furthermore with their price. I also really loved the stamps – price 12.99 $ – but my absolute highlight is the acrylic stamp mount with a grid and a handle! (14.99 $) – works great!!! Here is a photo of my goodies. Only the white ink pad doesn’t work to good. Martha is my idol. Und die Acrylplatte muss ich UNBEDINGT haben. Ach du GlÃƒÆ’Ã‚Â¼ckliche, hast dir sicher den Koffer vollgepackt mit Zeuch… zeig uns den Rest auch noch!